Size listed (inflated): 10.6 x 18.5 x 9 in (27 x 47 x 23 cm) This can change depending on level of inflation. The MontBell U.L. Comfort System pads and pillow are a set of integrated and exchangeable sleep gear. It utilizes MontBell's Quick Connect Joint System that allows 2 or more pads to be connected for use in various situations. It allows me to take just what I need for any given trip. A short pad alone for the lightest endeavors, or everything for luxury trips. As I always sleep with a pillow and am pretty tall I plan to use all of the pieces on every trip over the next four months of testing. The Quick Connect Joint System consists of a set of holes at the ends of each piece located at the corners. These holes have been punched through some heavy reinforced laminated nylon. Two of the holes kitty-corner from each other have a toggle tied on. By taking the toggles from one piece and slipping it through the holes of another piece the two are now attached for the duration of the night. The pad is a self-inflator that has what MontBell calls "tube-on construction". It has a plastic twist valve to let air travel in or out of the pad. It is supposed to self inflate and can be topped off by blowing in the valve. It looks like there are four flat tubes running lengthwise in the pad. The pad comes with an attached compression strap to hold it in a rolled-up position. (Seen this way to the right.) Another use of this strap is as a pillow strap. It is meant to keep a stuff sack filled with clothes from sliding away when used as a pillow. 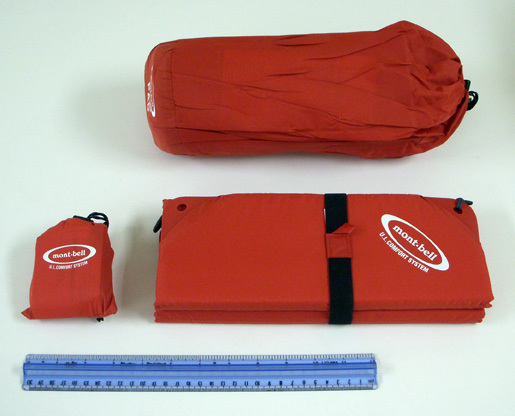 For extra protection when traveling the pad can be kept in the provided 0.8 oz (23 g) storage sack, seen below. Inside the sack, hidden in a pocket is a 0.4 oz (12 g) repair kit. The pillow is an inflatable air pillow. 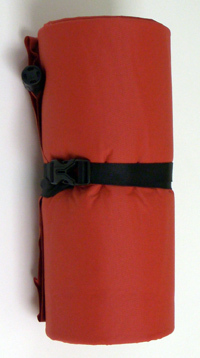 A warning is given that it is not strong enough to support body weight, and that it should NOT be used as a camp chair. (If used in such a manner it may be a short lived whoopee cushion�) It also comes with warnings to keep away from fire, sparks and stickers. I shall be careful with this one. The pillow is inflated by mouth with the valve on the top left side. It has an indent formed in the pillow when inflated, I suppose to cradle the head. It too comes with a repair kit identical to the one with the pad. I will be carrying just one of them. It also has a tiny 0.3 oz (8.5 g) storage sack. The pillow can be used in a few ways that I can see. It can be used alone. It can be attached to the end of the pad and used to extend the length of the pad. This should probably only be done in warm conditions as there is no R-value to speak of in the un-insulated pillow. Last it can be flipped over so that it sits on top of the pad giving the pillow both some insulation from the cold surface and an extra bit of height. Here are the two attached ways to use it. By switching the connection I can keep the valve away from my face in either style. And finally I present the Extension Pad 30. It is a closed-cell foam mat that may be used as an extension to a shorter pad to get full coverage by attaching it with the Quick Connect System. It may also be used alone as a sit pad. 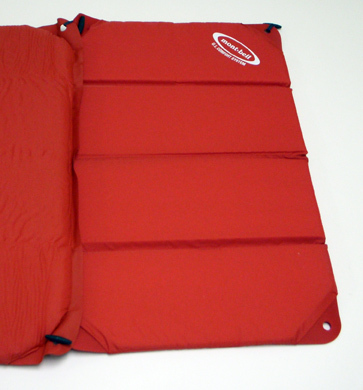 The extension pad is separated into four sections within its cover and can be folded up accordion style as seen above. A very loose black elastic band is provided to keep it from unfolding. Here is a picture of it attached to the pad. Well, thank you for joining me on this journey of discovery with the MontBell Comfort System. If you come back in a couple months you may see how they worked for me in the field. Jenn and I went to Agua Bonita Spring in the Santa Rosa Mountains. This was a very hot hike that dropped from high desert to low desert. Highs of 75 F and a low of 33 F at night (24 to 1 C). I carried a 32 lb (14.5 kg) pack. We went 21 miles (34 km) with 2950 ft (899 m) of gain and loss. I used it on an overnight snow camping trip in Minnesota. I stayed in a clearing near the river bottom by the Red River outside of Moorhead. It got down to 12 F (-11 C) and the humidity averaged 64%. The picture below is from this trip. The following weekend I drove up to Lake Bronson, Minnesota, near the Canadian border. The low was 33 F (1 C). Next I used it on an easy overnighter in the Angeles National Forest near Lake Hughes, California. I stayed at 4000 ft (1219 m) elevation. The low temp was 26 F (-3 C). Then I used it in a non-breathable single-wall Nemo Nano Elite tent on private property in Moorhead, Minnesota in flood conditions with a storm coming in. The temps only made it down to 38 F (3 C), but the humidity was at 74%. 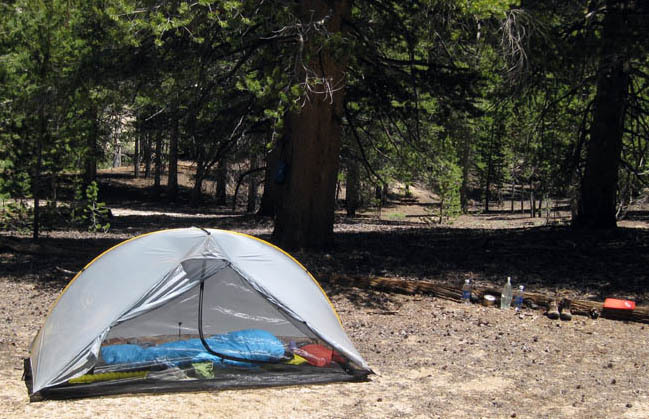 And lastly (that I am going to list) was a two-night backpacking trip in San Jacinto State Park. Both nights were spent at Strawberry Junction at 8040 ft (2451 m) elevation. The lows were 28 F the first night and 25 F the next (-2 and -4 C). The Comfort UL system has been a mixed bag so far. One thing that is great across the board is the size that these pieces pack down to. As a person that appreciates reduced pack size as a very close second to lower pack weights, these accessories make me very happy. Let me go through them from the top down. I have never liked air pillows. The biggest reason is, because they are so light, they tend to slip away during the night as I toss and turn. This is without doubt my favorite thing about the Quick Connect Joint System. It keeps the pillow in place. The first time I used it I brought my normal pillow set-up too just in case I did not like the UL Pillow. I never bothered with it as the pillow was great. It kind of disappointed my wife who told me as soon as she saw the UL Pillow that she wanted it if I hated it like I do the other air pillows. Well she is going to have to wait as I like this one. One place it was lacking was in Minnesota where I was sleeping on snow. I had the pillow off the pad as I needed all the length of the pad for my body. (I had the extension under the pad at my feet for insulation.) I noticed during the night that my head was getting cold and I figured it was from the cold air in the un-insulated pillow. I took care of the situation by folding my down coat over and under the pillow. This worked very well. I really love how tiny this pillow packs down. I can fit it anywhere. And it takes exactly three breaths to inflate it. I am going to buy two more of these for my children to take backpacking. The U.L. Comfort System Pad 180 also is wonderfully compact. It is much lighter than any pad I have owned other than plain old foam, and packs down as small as any I have owned, and smaller than most. But in this case it comes at a cost. I was not a bit cold on the pad except for the night on snow, but I expected that and brought a short Z-Rest to place under the Comfort 180 at the top part. I used the pad extension under the foot part. In fact this has become the de facto way I am using the pad now. When in California I bring the full length model seen earlier. In Minnesota I use one of the kids' short models from my head down and put the Extension Pad 30 under the foot end. This keeps me from hitting the ground and lets me sleep comfortably. Since the weather is starting to get too warm for the MontBell Downhugger sleeping bag I am testing in conjunction with these items, I have found myself using the bag as a quilt. I just lay the open bag over myself instead of climbing in it or wrapping myself with it. Doing this means that I must lay right on top of the Comfort UL pad. Thankfully I can report that the cover material lives up to the pad's name and was fine to be on without the benefit of a layer of sleeping bag. It does not have a plasticy clingy feel to as some pads in my experience when lying directly on them. Here is another piece that I really like. It works well attached to the end of the Comfort 180 pad to add extra length. It also works well to add insulation under the pad as I did in Minnesota on snow, pairing the Extension Pad 30 with a short Z-Rest. The length of one of my tents is so short that I can't attach the Extension Pad at the end. So I just slide it under my shoulder to give added support there. 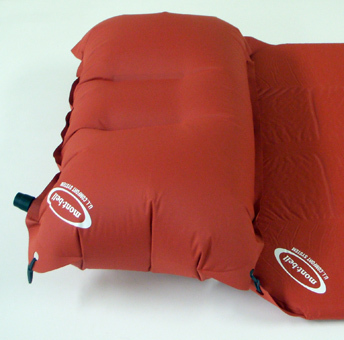 But what I like the Extension Pad 30 best as is a replacement for the blue foam sit pad that I take on every winter hike and many 3-season trips. The Extension Pad 30 makes a great sit pad. I love the way it folds up. It is much easier to pack and stow than the blue foam. It fits inside my pack where I put it on top of my load, or easily slides into the stuff pocket on the outside. So far the cover has not picked up water while using it on the snow. I will watch to see if the DWR wears off from using it this way. Below is a shot of it being put to good use in this fashion at Strawberry Junction. 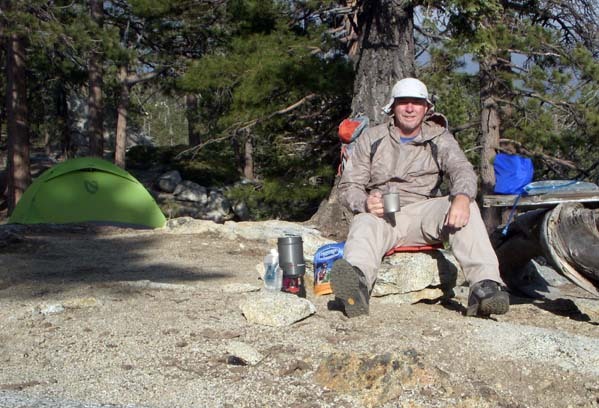 First they went on an over-nighter in the San Gorgonio Wilderness by way of the Momyer Creek Trail. Forecast was rain turning to snow. I set up camp at Saxton at 8400 ft (2560 m) elevation. Temps ranged from 39 F to 55 F (4 to 13 C). Next I used them on a two day trip to Maplewood State Park to pre-scout sites for this summer's hiking with the kids. The trails were free of snow but quite wet and muddy in spots. I walked 12 mi (19 km) carrying a 21 lb (9.5 kg) pack. The temps ranged from 34 to 45 F (1 to 7 C). I used them on a four-day trip to the Hetch Hetchy region of Yosemite National Park. The coldest it got was 35 F (2 C) and the elevations ranged from 3800 to 8400 ft (1160 to 2560 m). I also used the pad in the backpacker's campground the night before the hike. I went back to San Gorgonio Wilderness to do some bushwhacking to find an old unmaintained trail. I spent the night at Limber Pine Bench. It was much warmer this time. The temps were between 42 F and 67 F (6 to 19 C). I went about 18 mi (29 km) over every kind of terrain from rock to deep pine and oak duff. Next I used them on an over-night backpacking trip with my children, Emma and Ray. We went to Maplewood State Park in Minnesota where we camped at Cow Lake. The trails were still very muddy in places. The temps ran from 80 F down to 48 F (27 to 9 C) and it only sprinkled a little in the evening. We went about 7 mi (11 km). Nothing much has changed from my last report. All pieces are in very good shape even though they have been out a lot, stuffed a lot, and handled a lot, including many airport security checks. (Hector Airport in Fargo ND still opens every piece of my checked luggage because of a stove incident in 2003.) I have had no leakage at all from the two pieces that inflate and no excess wear on anything. As before I shall go through the list. My kids love it too. They had to take turns using all these pieces, camping out in the front room. Them saying the pillow works well for them is a boon to me as I can replace their heavy pillows (that I carry because of the space they take in their packs) with the MontBells. As warmer weather has led to me to use the pillow directly under my head without my sleeping bag's hood in between, I have noticed a bit of discomfort from sweating and sticking to the shell. It was very easily taken care of by placing the pillow inside my T-shirt. I plan do this right away from now on. I plan to be using the MontBell pillow for a long time to come, and will be buying two more for the kids. I have needed to continue to bolster the pad by using something else with it to accommodate my side-sleeping style and weight. (My kids borrowed it for a night each at home and think it is the best! Of course they are less than half my weight.) Having to carry my full size Z-Rest adds 14 oz (395 g) to my total pad weight, using one of the kid's short Z-Rests adds only 11 oz (310 g). But I found a better alternative in a 0.25 in (0.6 cm) ThinLight pad from Gossamer Gear that only adds 5.2 oz (147 g) yet is just enough extra support to allow me to use the Comfort Pad. These extra pads allowed me to keep using it for the rest of the test. I cannot use it by itself though. While I have not experienced any true problems with the pad, one thing that I expected to change with use has not. When brand-new the pad did not self-inflate upon opening the valve and unrolling it. On the last trip I took the pad on (Maplewood SP #2) I set it on one of the picnic tables that the park officials haul out to every backpacking site, opening the valve to let the pad inflate while I set up the tent. When I went to put all our pads inside, the Comfort UL was still flat and compressed. It is not a big deal as it only takes me four to five big breaths to inflate it but I thought that the company and our dear readers may want to know about the phenomena. The strange case of the open-cell foam that refuses to open. I still really like this little piece of folding foam. I take it on almost every trip I go on, even some day hikes that were not listed above. This is because it works so well as a sit pad and is easier to carry than my blue-foam sit pad. 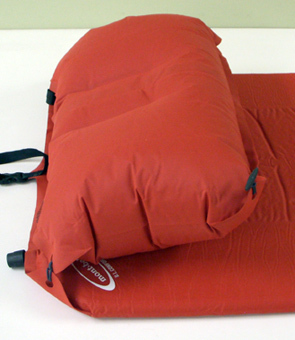 I have been using a new air pad lately and have used the Extension Pad underneath it at my shoulder and chest area to add some insulation in cold locales. When in big enough tents I still use it for what it was designed, adding length to my pad for when I want to stretch out. 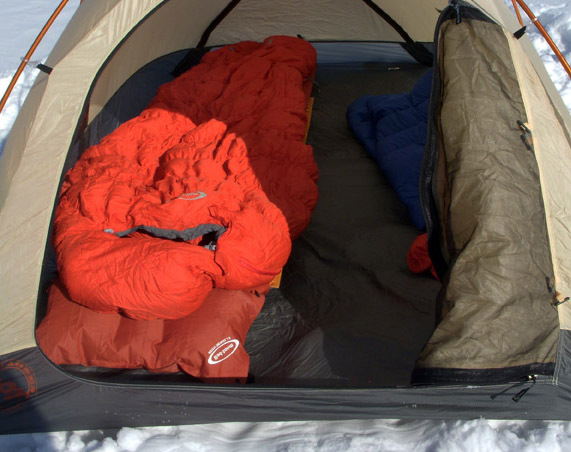 And I have used it folded in half in front of my pad to give the pillow some extra height and insulation when I could not keep the pillow on the pad due to tent space constrictions. I would like to thank MontBell and BackpackGearTest for allowing me to participate in this test. While the pad did not work as well for me as it may for others, the other two items are going to be along for further adventures.